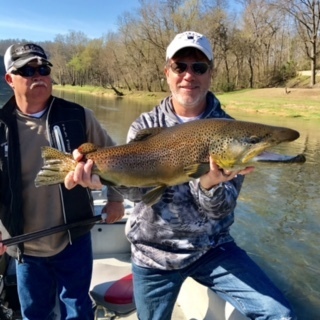 One of the Ozark’s most accomplished anglers, Lou Treat, has been fishing since he was old enough to hold a rod. His angling instincts have been well-rewarded with a long list of accolades. Among the highlights, he’s a 7-time qualifier to the Red Man All-American finals, a 3-time Angler of the Year, and his countless successes even qualified him to fish the first-ever million dollar FLW bass fishing tournament. Lou literally grew up on the White River; fishing and camping with his dad before he was old enough to attend school. Today, that vast depth of experience has made him one of the area’s most recognized and accomplished guides. He’s written articles for Field and Stream as well as Outdoor Life and enjoys sharing all of the beauty, memories, and excitement of the famed White River. From live bait to artificial lures, Lou’s right at home on the river and it’s no wonder. Having spent a half century learning every inch of the winding waters, he understands how the fish behave in all types of conditions. Like everyone on the GTO team, there’s a passion in Lou that thrives on watching his party celebrate all that the river (and fish) hold in store. From the young to the young at heart, his personality immediately puts folks at ease with the knowledge that every trip is going to be a special experience.